Creates a new data model. A proxy model that proxies its source model unmodified. A WIdentityProxyModel simply forwards the structure of the source model, without any transformation. 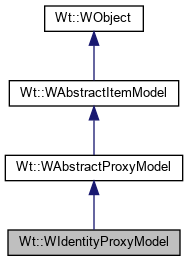 WIdentityProxyModel can be used as a base class for implementing proxy models that reimplement data(), but retain all other characteristics of the source model. Translates the parent index to the source model, and returns the number of columns of the source model. Returns the child index for the given row and column. Inserts one or more columns. Inserts count columns at column column in the source model. Forwards the result indicating success from the source model. Inserts one or more rows. Inserts count rows at row row in the source model. Maps a proxy model index to the source model. Returns a model index with the same row and column as the source index. The parent index is mapped recursively. Maps a source model index to the proxy model. Returns a model index with the same row and column as the proxy index. The parent index is mapped recursively. Returns the parent for a model index. Translates the child index to the source model, and translates its parent back to this proxy model. Removes count columns at column column in the source model. Removes count rows at row row in the source model. Translates the parent index to the source model, and returns the number of rows of the source model. Set header data for a column or row. Sets the header data for a column or row in the source model. The source model provides the actual data for the proxy model. Ownership of the source model is not transferred. All signals of the source model are forwarded to the proxy model.